1998-2000, UNISA, South Africa (Master of Missiology). Position: Head of the Department of Theology and Praktichesakogo WSL. 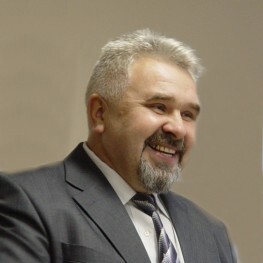 Pastor of “Logos” Baptist Church, St. Petersburg.Disciplines: Evangelism and Discipleship, Homiletics, Missiology, Practical Ecclesiology, Pastoral studies. The church is going through difficult times. It is important that knowledge is not stuck in one’s brain and on the pages of books. It requires analysis and understanding of the situation in order to practically realize the potential of the church in its development and implementation of its intended mission. Therefore, the region of interest extended to all that relates to the practical side of Christianity. I do monthly live broadcasts on radio Teos and TSR (Trans world radio).